Home » art , beautiful , diamond sky productions , enterprise , photography , star trek » Want a BEAUTIFUL image from STAR TREK for your desktop? Want a BEAUTIFUL image from STAR TREK for your desktop? If you saw Star Trek over the summer then you'll remember that stunning shot of the Enterprise rising out of the atmosphere of Saturn's moon Titan. 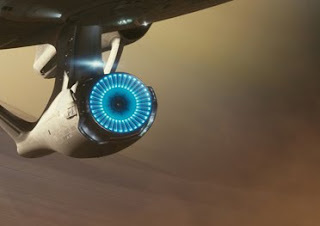 Diamond Sky Productions has just posted two VERY high-res images from that scene: one of the Enterprise's engine nacelles breaking through the clouds and a second of the Enterprise emerged in all her glory. The image at right is just a small preview of the entire picture. I'd already had a pic of Enterprise with the shuttles arriving as my desktop wallpaper for the past few months, but I've already changed it to this one. Dunno how long these'll be up, so grab 'em while you can!